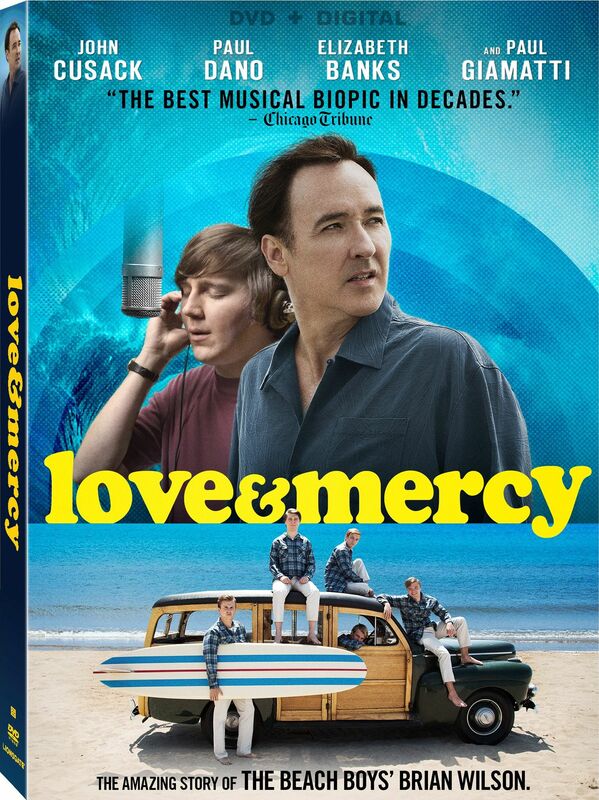 It is almost impossible for a diehard Beach Boys fan to watch Bill Pohlad’s “Love & Mercy” (released by Lionsgate 9/15/15 on DVD and DVD Blu-ray) with any sort of objective detachment. The Beach Boys’ world was (and still is, to a degree) mired in politics and inter-band/inter-family feuding. If someone managed to make a film about the band that covered all the differing viewpoints, it would probably be about ten hours long. Here, like it or not, we are presented with Brian and Melinda Wilson‘s perspective (or what Smile lyricist Van Dyke Parks has called, with characteristically acerbic wit, “Mrs. Wilson’s Biopic”). Brian Wilson, lead singer of The Beach Boys, is a musical genius suffering from mental illness (exacerbated by drug use); he is physically and verbally abused by his manipulative psychotherapist, Eugene Landy (brilliantly portrayed by Paul Giamatti). He falls in love with Melinda Ledbetter, who is kindhearted, tough and completely unafraid. She sets about trying to wrest Brian from the clutches of Landy, and works to reunite him with his family (whom Landy had discouraged Brian from seeing). Whether or not this portrayal of Ledbetter as Hero and Landy as Villain is historically accurate, is beside the point. It’s best to put the politics aside (if you possibly can), and view the film for what it is: a love story, a story of redemption and resurrection, and a celebration of some of the finest pop music ever created. The film alternates between three different periods of Brian’s life: Brian in the 1960’s, recording Pet Sounds and later, Smile; 1970’s Brian (who, famously, stayed in bed in his bathrobe for about two years, due to crippling depression), and 1980’s Brian, who meets and falls in love with Melinda Ledbetter while still under Landy’s control. Paul Dano portrays the younger Brian, and bears a startling resemblance to him in the opening scene. Sitting at a dimly-lit piano, he worries aloud what would happen if he lost his ability to compose music. (Dano has Brian’s mannerisms down, from his slight slouch to the way he tends to speak out of one corner of his mouth.) The scene ends with an atmospheric mashup of moody late 60’s Beach Boys songs; the dreamlike mood is abruptly broken with an early 60’s montage of fun, sun and surf – Brian goofs with his brothers on the beach with a surfboard, and performs with them onstage, smiling and laughing, to a crowd of screaming fans. Their first date (a Moody Blues concert) sets the tone for their relationship: a limousine arrives at Melinda’s apartment, accompanied by a uniformed chauffer, and the ever-present bodyguard and Landy in tow. During the concert, Melinda comments to Brian that she likes the band; Landy, in his constant need for control, asks her to repeat what she just told Brian. She soon realizes that there will never be a private moment between her and the musician, as long as Brian remains under Landy’s command. Melinda also discovers the extent of Dr. Landy’s manipulation. During dinner, accompanied by Landy’s son, Evan, and his girlfriend, Brian opens up to Melinda about his past, and his father’s abuse of him as a child (which he believed resulted in the hearing loss of his right ear). Evan’s girlfriend, appearing uncomfortable after Brian loudly imitates the sound of his father’s blows (slamming his fist forcefully into his palm), suggests they give the couple some privacy. While they’re alone, Brian tells Melinda that he hasn’t seen his family in years, including his two daughters; Landy has advised him against seeing his family. Something clicks with Melinda as she’s listening to him speak; actress Elizabeth Banks conveys both sadness and alarm in her eyes. The remainder of the film becomes a power struggle between Melinda and Landy, as she witnesses increasingly abusive behavior towards Brian. At one point Landy warns her that Brian is a “very sick man” and a paranoid schizophrenic, but that he’s got it “under control. I am the control.” Melinda also discovers that Brian is being over-medicated. During one visit, the housekeeper, Gloria, pulls Melinda aside and shows her a large jar of pills. “Too much!” she cries. Melinda works with Gloria to try to get Brian back in touch with his family, and away from Landy’s destructive, controlling influence. While the 80’s story of Brian, Melinda and Landy is playing out, it is spliced with relevant moments from the 60’s and 70’s. There are several scenes in the studio of Brian recording Pet Sounds and Smile with The Wrecking Crew (the notorious group of L.A. session musicians who played on many major recordings of the day). It was a wise move on the director’s part to have real L.A. musicians portraying the session players. They look perfectly at ease and at home behind their instruments, dressed in period clothes. We also witness the legendary stories Beach Boys fans are familiar with: father Murry’s abuse of Brian as a child; Brian’s nervous breakdown on an airplane while on tour with the band; the grand piano in the sandbox; Mike Love’s angry dismissal of Van Dyke Parks’ poetic lyrics (“What does this mean?”). We also see Brian’s first acid trip, beautifully accompanied by an instrumental version of “Don’t Talk (Put Your Head on My Shoulder)”. Some Beach Boys fans tend to view Mike Love as the unsympathetic and abrasive band member who tried to stifle Brian’s creative spirit, telling him to stick to “the formula” – catchy surf songs about girls, cars and the beach. That side of him is definitely portrayed as he criticizes the “depressing” songs on Pet Sounds, and bickers with Brian about the band’s direction. The film also shows the flipside of their relationship, however, which adds more believability and depth to Love’s character. Following one of their many arguments, Brian retreats to the piano, and begins banging out the chords to what would become “Good Vibrations.” Mike walks over and, while apologizing to Wilson for his harsh criticism, also takes favorable notice of the chords being played. They begin to collaborate, with Love adding the melody to the chorus and lyrics. The scene might feel a bit Hollywood, as most movie scenes are that try to capture songwriting in the act; in a film with such clearly defined good and evil characters, it’s an important scene and adds a much-needed realism. The relationship between Brian and Mike, like most family and artist relationships, is complex. Elizabeth Banks exudes warmth, caring and nurturing patience as Melinda, as well as courage. Paul Dano is transformative as young Brian; he gained weight for the role, and the resemblance to the chubby Pet Sounds era Brian is striking. As far as Cusack, like Dano, he’s adopted Wilson’s awkward mannerisms and eccentric nature, and transforms into Brian, personality-wise. Whereas Dano greatly resembles Brian physically, however, Cusack simply looks like a somewhat disheveled and confused version of himself. Paul Giamatti is menacing as Landy, yet he reveals subtle layers just beneath the surface. We can see that, in his own twisted way, Landy cares deeply for his victim, but it sadly manifests itself in a need to control and dominate. Inevitably, Beach Boys fans will dissect the fact vs. fiction in the film; they would be wrong, though, to dismiss the sheer acting prowess that was involved in telling this story, whether it’s fact, fiction, or somewhere in between. Special DVD features include commentary with Bill Pohlad (producer/director), and Oren Moverman (executive producer/co-writer), a documentary about creating the “look” of Love & Mercy, “A-side/B-side: Portraying the Life of Brian Wilson,” and deleted scenes. This entry was posted in Miscellanious, Movies, Music and tagged Beach Boys, brian wilson, Carolyn Edwards, Carolyn Soyars, Live Music, Movie. Bookmark the permalink.